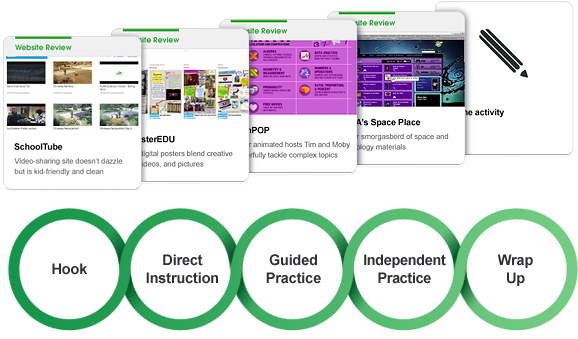 Graphite is a nice site by Common Sense Media that has reviews and ratings on apps, websites and games for educational use. You can search for them by content, price, platform, grade level, and Common Core State Standard. Each resource is rated by educators too. If you sign up (free) you can create boards and favorites, review resources and create something called App Flows. This looks like a great resource. An App Flow is an interactive framework tool that enables teachers to seamlessly flow apps, websites, and games throughout lessons. Starting with the familiar five-part lesson plan, an App Flow provides scaffolding to think with purpose about where, why, and how to integrate digital tools for learning into the curriculum. Teachers choose individual apps, games, or websites that match each component. This is a great resource for busy educators looking for apps and websites to use in school.